Are you looking for an excellent source of protein for your fish or exotic pet? Flightless Fruit Flies are high in protein, nutritious, low in fat and provide essential amino acids that are ideal for aquarium fish, birds, new born lizards, amphibians, scorpions, spiders, mantis and even carnivorous plants. In fact, surface feeding fish eat our flies voraciously. Depending on the temperature, Recorp Flightless Fruit Fly Cultures are self-propagating meaning it can take as long as 14 days (for the D. Hydei) to begin producing larva and flies for up to a month. The rapid lifecycle means a constant supply of food for your pet(s). WILL FRUIT FLIES FLY AWAY? Our Fruit Flies Do Not Fly. 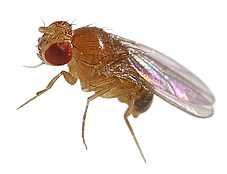 Our fruit flies are specifically bred to be flightless so you never have to worry about them buzzing around your head. They are also completely harmless. Optimum reproductive rate occurs at temperatures around 80°F (26°C). If you reduce this temperature to 60°F (15°C) reproductive rates slow extending the feeding time from one culture. From our experience, fruit fly cultures thrive at room temperature. Experienced feeders can opt to raise a limited number of flies (say about 50) at any given time. HOW TO FEED YOUR PET? Before feeding your pet, take your fruit fly container, ensure the lid is still on tight and lightly tap the container against a hard surface. This will ensure the fruit flies fall to the bottom of the container and won’t escape. Now, remove the lid and gently tap the container over your pet’s feeding area until the desired number of flies fall out. We offer the flightless Drosophilia Hydei measuring 1/8 inch.